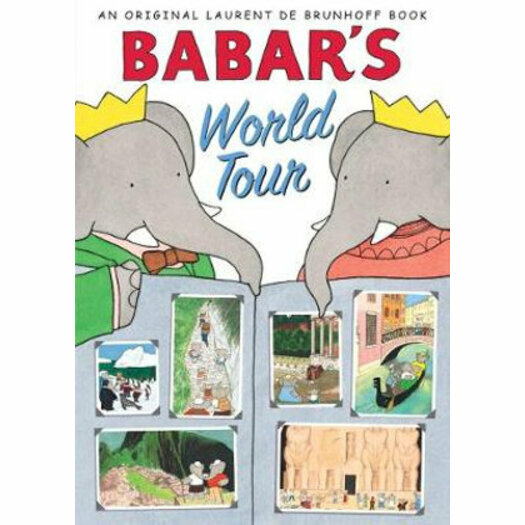 The latest from venerable storyteller and brilliant artist Laurent de Brunhoff has Babar's family on a world tour! They visit a number of countries around the globe. First stop is Italy where they learn to say 'Buon giorno! Hello!' After that, it's off to Germany, Spain, Russia, India, Japan, and Thailand. Then Mexico, the Southwest United States, Egypt, Antarctica, and, of course, France. In each place the children learn to say 'hello' and discover a bit about the local culture. Babar's World Tour is a wonderful way to introduce children to an international array of cities and customs and will be fun for globe trotters and armchair travellers of all ages! Laurent de Brunhoff has kept the spirit of Babar and his family alive for more than 60 years. Originally created by Laurent's mother as a bedtime story, Babar the elephant first came to life through the art of Laurent's father, Jean de Brunhoff, who produced seven books about the character before his untimely death. Building on his father's original framework, Laurent has gone on to provide many new adventures for the elephant family while giving them new spirit through his use of line and colour. Laurent de Brunhoff lives in Connecticut with his wife, writer Phyllis Rose.